Pegasus Equine Guardian Association (PEGA) formed to unify efforts to preserve and protect these free roaming herds. PEGA asserts that the free roaming herds of Kisatchie have been a part of Louisiana’s local culture since its early beginnings, and therefore should have Heritage standing, as descendants of the animals that toiled alongside homesteaders that shaped the early history of parishes in and around Kisatchie National Forest. For well over a century, horses have roamed the Kisatchie National Forest in Louisiana, which is approx. 604,000 acres in which the US Army occupies approx 250,000 acres. These wild and free-roaming horses, over years and generations, have reverted to their wild state, especially through their offspring who have never known anything other than wild. In the past Army has at least tolerated the horses and some have actually enjoyed their presence. Some commanders appreciated them even enjoyed their presence and stated that he didn’t want to lose the horses, which had become an integral part of the environment of the training areas where they constituted an element of realism. In August 2015, a new commander, Brig. Gen. Timothy P. McGuire, approved (if not ordered) the removal of the horses. The Army held a public meeting to discuss a good plan for their disposition on August 13th, 2015. Part of the outcome from the hearing, was recommendation that the public submit comments & proposals for humane solutions regarding the equine presence in Kisatchie and at Fort Polk. Comments/Proposals were to be submitted by Sept 5th, 2015. By the end of the comment period in September 2015; over 1200 individuals sent approx 2,736 letters to Congress. Public demand for conservative, humane, ethical treatment of these animals is undeniable and support continues to grow as seen by the steady increase in support today. These horses are culturally, historically, and genetically significant. The Commanders at Fort Polk come and go every couple of years. Previous Generals allowed the horses some even fought to preserve them, protecting the sanctity of the land, history and animals. It is grossly unfair that a temporary commander is making a permanent decision on the behalf of future generations. There is a very real possibility that some of the remote herds are of Spanish Mustang decent, and would be Federally protected and should not be managed to extinction. The population management of these horses cannot be a brute attack on their future ability to thrive and exist. It is vital that this herd management is done with careful, conservative, scientific, humane consideration. Ethical and human solutions be the goal, that may, in the end, include a mix of finding good adopters for some horses, fertility control for others, and remain in place for yet others (particularly the horses with specific historic and genetic importance), along with some herd control measures to keep horses away from sensitive areas of the fort property. But the only way to find the best solutions is to engage in honest and open consultation with as many experienced people, experts, and local stakeholders as possible. The people of Louisiana area are patriotic and supportive of the military. We are also proud of our history and our heritage. These horses are an important part of the history, culture, and heritage of this area. We implore officials to include Specialized Wild Horse Professionals and Equine Advocates to assist Fort Polk in devising and executing an ethical and humane solution to the equine presence in Kisatchie / Fort Polk / Peason Ridge that allows the military, the civilians of the area, and the free horses to peacefully and safely coexist as they have done for the past century. 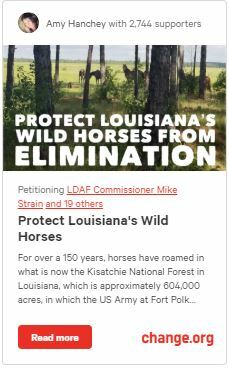 As concerned citizens our goal is to protect the Wild Horses, in Kisatchie National Forest including herds at Fort Polk, Peason Ridge, etc.. who trace their heritage from 1940’s Camp Polk Cavalry horses and early settlers’ farm horses. We are in awe of their ability to self sustain as a wild herd for more than 75 years.Our efforts focus on advocating for sanctuary with responsible herd management and non permanent fertility control. PEGA strives for a Win/Win outcome for the Ft Polk Wild Horses and the US Army. Please be respectful in your dealings with Ft Polk Officials we do not want any chance of pro-horse slaughter individuals to attempt to profit by gaining access to even one horse from this historic herd to sell to Mexican slaughter plants. They are both irreplaceable and worth so very much more than their price per pound. Although there have been reports of such activity as well as official requests by locally known kill buyers for access to obtain horses. While there have been discussions of potential adoption for a portion of the herd – as guardians we do not recommend this for any horses that have lived wild for the entirety of their lives, and should only be considered a last resort. These comments and ideas may be part of the record to be addressed in the Environmental Assessment. See more about PEGAs Purpose and Objectives. 1) The horses that are seemingly more socialized to humane activity. These horses congregate near the base and the training area known as the Drop Zone. 2) Wild Horses located near Peason Ridge – These horses are a very tight knit herd and are more isolated. My question, why is the ARMY in the national FOREST??? and there are 604,000 acres, and army ocuppied 250,000. The intention of the removal of horses is Army wants to take Up ALL 604,000 acres??? right??. What is going on with the ALDF lawsuit regarding the horses with the army??? and Tulane Environmental law clinic ??? Are these wild horses protected under the 1971 Free roaming?? ?